India—’giving me curry’ all the way | Where to next? We’re already two weeks into our overland jaunt across northern and central India and I’m still not tired of eating curry. In fact, with the exception of a couple of pieces of toast, one bowl of cereal and quite a bit of fruit, I’ve had curry at every meal since 24 January. And all I can say is Bring it on. I like to think I make good curries—to be honest, I do a very good job—but the master curry makers are in India and we keep encountering them every day. For starters we got street food—skewers of fish and chicken cooked while we waited and served up in a large stainless steel bowl. Delicious and spicy. 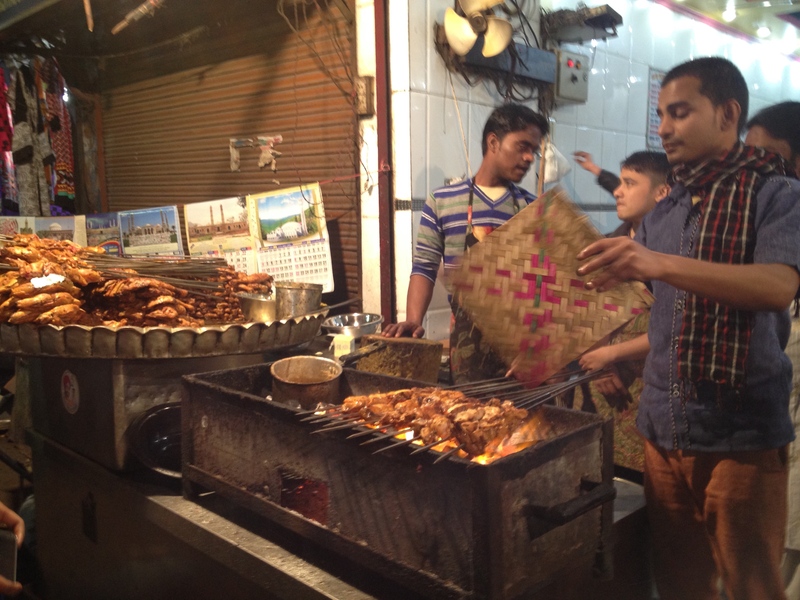 The first dinner was in a restaurant in Old Delhi, not far from the Jama Mosque. This narrow eating establishment is part of the Rehmatullah Hotel, with a bit of seating both downstairs and upstairs. 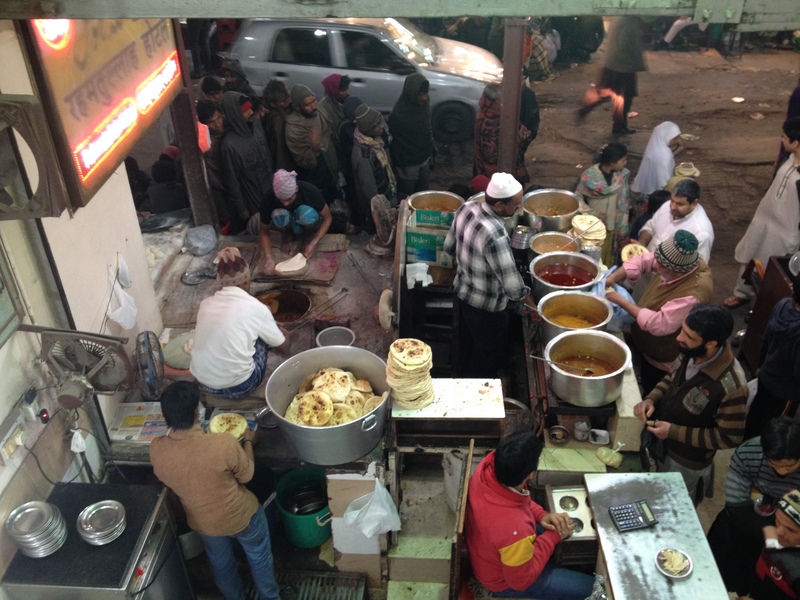 From our upstairs perch, we could watch the chefs ladling up bowls of curry, rice and dal, and adding plates of bread. We could also see several rows of men squatting on their haunches on the footpath out the front of the restaurant. These fellows, who are beggars, take up this position daily outside many restaurants waiting for the day’s leftovers or to have a generous diner pay 40 cents or so for a meal to be served to them before the restaurant is closing up—a sensible option if leftovers look to be running low. 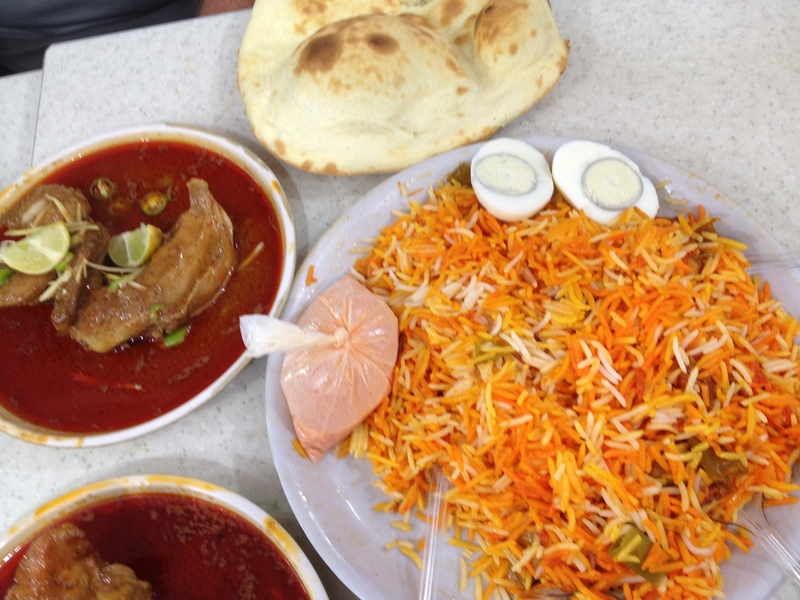 We enjoyed a simple meal of saffron rice, chicken curry and bread. A couple of us added some rupees to the payment so a couple of beggars could get their meals early. I desperately wanted to take a closer-up pic of these fellows, but it just didn’t seem right. Too intrusive. We had some truly wonder meals over the last two weeks. 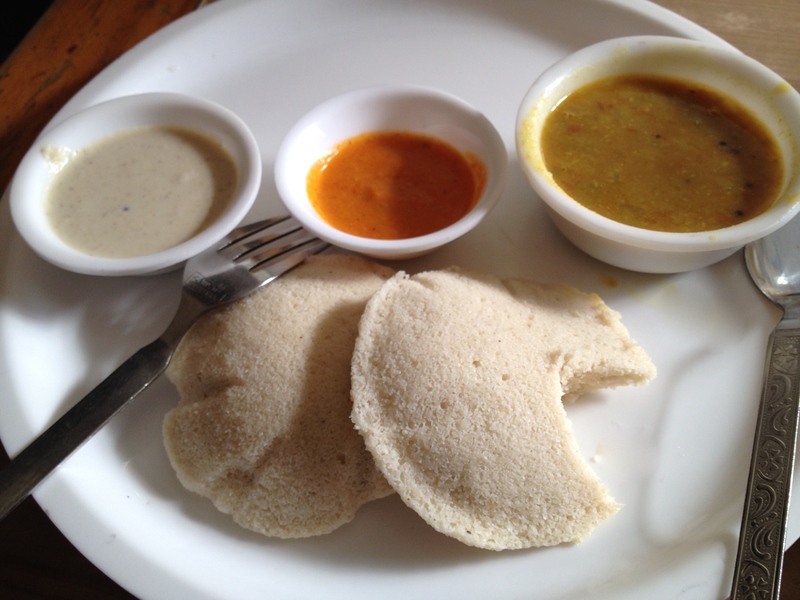 One that surprised a couple of fellow travellers was the idli with sauces for breakfast. We’ve had this South Indian breakfast dish before, so I knew exactly what it was—little pancake-y rounds made from de-husked black lentils and ground rice. We had three dishes on the side—coconut, chilli sauce and dal. These were the nicest idli I’ve ever had, so well worth recalling. We also had a delicious lunch at a rundown roadside cafe not far over the border into Rajasthan. Two dishes were Rajathani specialities and they were excellent. I was surprised to see that one of them included pasta, but then pasta is widely sold in the markets throughout India. They also served chai (spiced tea) is small pottery cups that are meant to be thrown away after use. Seems such a pity. And another favourite has been the thalis. 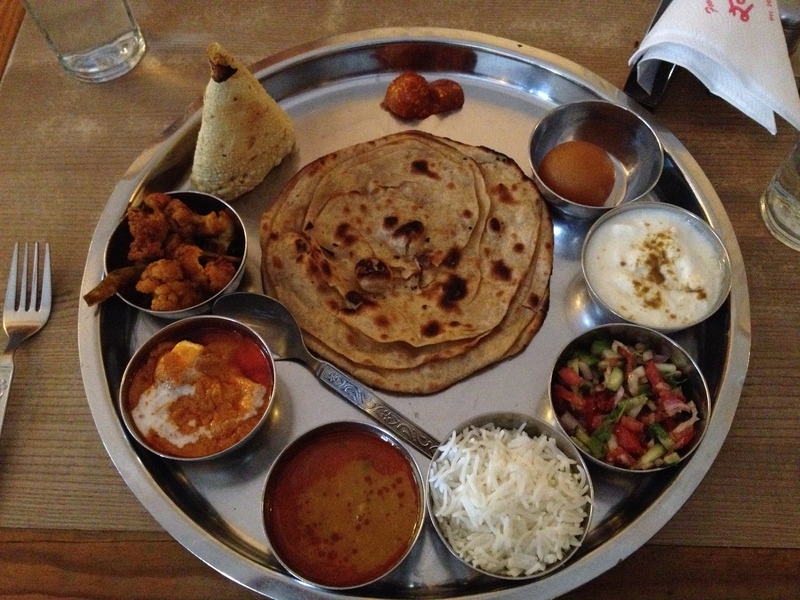 A thali is sort of a sampling plate. There are lots of little bowls with a selection of dishes such as curry, rice, vegetables, curd or raita (yogurt), dal, bread, roti and a sweet. We’ve had a couple of sensational thalis, especially one at a restaurant in Jaipur called RasRaj. If you ever get the chance—go there! It was one of the two best meals we’ve had so far and I didn’t get a pic of the best one in Jaisalmer at a small rooftop restaurant called Sunset City Palace. That menu included a speciality dish of desert vegetables which apparently grow only in Rajasthan. I LOVE your food photos; never fails to make me very hungry! What is in the plastic bag on the plate with the saffron rice? Thanks Carol, it’s a bag of chutney. These all look delicious, Peggy! It’s a shame that I have to use my imagination for the aromas and flavours. Indian, Pakistan, Afghanistan food). You can get a very good meal and a lot of food for around $8-9 US. I often get curry goat, Shis Kabob (ground meat), dal, rice… with a salad and raiti (yogurt) and Nam bread. Nice photos and assortment of curry foods… never heard of Idli… ( Looks a little like Ethiopian bread???). I’m glad you got a ‘kick’ out of the curry post and found your way to an Indian restaurant. Good food pics, Peggy. I can almost smell the dishes and your descriptions are marvelous. Explore and eat on my old classmate. Thanks Mike, next time I’m in Nebraska, I’ll make a curry or two. Fabulous. Oh how I love curry. I wonder if I’ve ever had a curry anywhere near the real thing. Lucky you! Believe me, I know how lucky I am. My cooking blog has a very good fish curry recipe, in case you’re interested. Many thanks Anne. Did you receive the Antarctic photos I sent to your email a while back? Oh I’m so jealous! Especially because of the chai. You’re living my dream these weeks, take care! So Peggy, I hope you don’t choke on all that magic food while I have a breakfast of Weetbix and stewed plums. Have a great time. Oh you poor thing. 🙂 But sometimes a Weetbix break is just the thing. Hope you get a decent curry sometime soon. Thanks for stopping by. Are you on another trip with Anand or have you ‘gone it alone’? We’re with Anand and Deepti. They send their best wishes to you. Hope you are on the mend. I so want to experience the flavor, textures and color of India. I’m enjoying doing it vicariously through you. I appreciate you joining in. India is a wonderful place to experience all the senses. If you in Delhi visit Chandani Chowk. Awesome street food! Curry on Peggy! Love to live vicariously through you!!!!!! Thanks for the company. Always appreciated. More posts coming soon. That’s the only food on a stick we’ve had so far. I’d better keep a lookout for more. Yesterday had a nice lunch at the Indian restaurant I posted about (correction- Indian, Pakistani, Bangladesh).. Beef Curry, Chicken Paddie, Cauliflour Curry, Salad with Raiti and Nam bread ($9 US). Then I went to an Indian grocery store and found in the freezer section Adli, so bought a package along with a Yogurt Curry Dumpling package. And this evening had this meal! But I am sure Peggy’s meal in India with three sauces had to be much better. So glad you found the idli. They make a great breakfast. So does Weetbix. Thanks so much. Off to check out your blog now. You are bringing me back to our trip in 2007! I can remember the idli for breakfast as street food in Dehli… served in bowls of folded leaves! The thali and the delicious food in Jaisalmer! I would like to back there again and eat curry and again curry… always different and soooo good! Hugs to both of you! Hugs back to you. We are having a wonderful trip with lots of fabulous food. Wish I could send you some. I love curry and I happily ate it for every meal in India – including the Indian breakfasts over the boring cereal and eggs Western one. I would love to go back for the food alone! The food is sensational. I’ve now been eating curry for almost every meal for six weeks. And another six to go. Lucky me. Your posts on food in India make me very hungry! Eating your way along makes me jealous! YUM! We didn’t have a bad meal in India, so YUM is right! Thanks for stopping by. I’m travelling right now (a lot of camping) so don’t have a good internet connection. I’d love to check out your blog when I get home at the end of the month. Thanks a lot..! 🙂 c u soon.. All the best..
Oh man…I shouldn’t read your posts when I’m hungry. 🙂 Just happy to say hi, and glad you’re safe and back on the homestead! Yes, nice to be home but wishing it would warm up. I’m over winter.